CityTalk | Launching today the Compact of Mayors, a milestone in local climate action! United Nations Secretary-General Ban Ki-moon and UN Special Envoy for Cities and Climate Change Michael R. Bloomberg today announced the launch of a global Compact of Mayors, the world’s largest effort for cities to fight climate change. The Compact will enable cities to publically commit to deep GHG emissions reductions; make existing targets and plans public; and report on their progress annually, using a newly-standardized measurement system that is compatible with international practices. Through this effort, cities will be choosing to meet the same requirements proposed for the international climate negotiations that will lead to a global climate treaty in 2015. The key partners of the Compact of Mayors are the world’s preeminent global city networks: C40 Cities Climate Leadership Group (C40), ICLEI – Local Governments for Sustainability (ICLEI) and the United Cities and Local Governments (UCLG) with support from the UN’s lead agency on urban issues UN-Habitat. 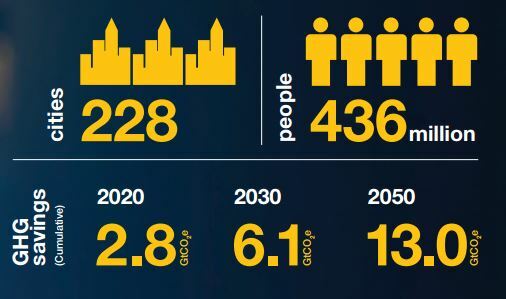 New research indicates that existing city commitments alone could reduce annual emissions by 454 Megatons CO2e in 2020 — a total of 13 Gigatons CO2e by 2050. The Compact is not just a huge step forward for cities, but also for nations. Importantly, it not only demonstrates cities’ commitment to helping nations set more ambitious, transparent and credible climate targets, but also will encourage nations to recognize local commitments; establish better policies; and direct resources to cities to limit any further increase in global warming. The full text of the Compact of Mayors can be found here.